KIEV, Ukraine—A video surfaced on Jan. 27 showing a fatal crash of a Russian Air Force bomber that occurred five days earlier at a military aerodrome in the Murmansk region on Russia's far northern Kola Peninsula. The aircraft, a Tupolev Tu-22M3 Backfire that carried the unit designation of "35 Red" and tail number RF-94159, was reportedly on a training mission. All but one of the four-man crew died in the resulting crash with the fourth in the hospital being treated for serious injuries. The video has gone viral on a number of Russian web portals, as it shows the aircraft on approach in very poor weather conditions—heavy snow, very dense fog—that are common to this region. It shows that the pilot did not realize how close the aircraft was to the ground until it was too late and he lands going much too fast and at a far too high sink rate. The aircraft breaks into two pieces and is consumed in a fireball as the sections spin down the runway. Most of the commentary since the crash from Russian sources is that the aircraft was landing in completely unsafe conditions and should have diverted to another base. Additional reports from Russia are that this aircraft was carrying an inert, training round mock-up of the Raduga Kh-22 (NATO Codename AS-4 "Kitchen") training missile. The Kh-22 is a long-range anti-ship cruise missile that was originally developed to be launched by this aircraft from bases in the same region. The design of the Kh-22 and other air-launched cruise missiles (ALCM) carried by this aircraft were specialized to sink U.S. Navy aircraft carriers operating in the Northern Atlantic. Delivering these carrier-killing cruise missiles was always one of the primary missions for this aircraft. The Backfire being able to launch these weapons at such long ranges was such a threat that they were the primary reason for the U.S. Navy's procurement of the Grumman F-14 Tomcat. The F-14 was the only fighter aircraft at the time with an air-to-air missile with enough range to shoot down the Tu-22M at long distances and before they could launch these ALCMs. What unnerves NATO military officials is that these kinds of training missions being conducted in such poor weather and other actions by the Russian air forces show Moscow is clearly still preparing for war against the U.S. Navy in a major military confrontation. Both U.S. Navy aircraft and naval vessels such as the USS Donald Cook find themselves being harassed by Russian military aircraft. The latest of these incidents, which have occurred in both the Baltic Sea to the north and the Black Sea in the south, took place in November 2018. In a 25-minute encounter, a Russian Sukhoi Su-27 fighter jet passed directly in front of a much slower and larger U.S. Navy four-engine Lockheed EP-3 and then engaged its afterburner, causing the U.S. aircraft to encounter severe turbulence and vibrations from the Sukhoi's jet wash. A similar event occurred in January of last year, when another Su-27 passed within five feet of another U.S. Navy EP-3. Other less dangerous intercepts have also occurred, "but there is a consistent pattern and increasing number of these attempts to intimidate the air crews of these surveillance aircraft and/or disrupt their mission," said a former Swedish pilot experienced in intercepting Russian aircraft over the Baltics. What alarms him and others is that "these near-misses and other attempts by the Russians to force U.S. and other NATO aircraft to change course are occurring in much greater numbers. There are many more of these incidents now compared to even Cold War years—and thus there are increasing chances for a real international conflict." 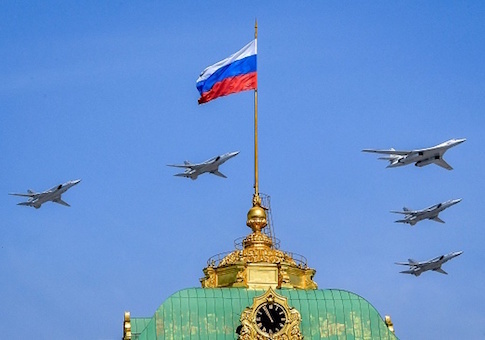 A Russian specialist with many years of experience in reporting on the Russian air forces offered an explanation for the uptick in these incidents to the Washington Free Beacon. "The Russian military does not realize that Barack Obama is no longer your president. They do not understand they are continuing to operate as before and that it is a far dangerous game to be playing with a more resolute person as the U.S. commander-in-chief." There have now been four crashes of the Tu-22M3 in past four years. The aircraft design is an old one, and even though the Russians continue to upgrade this platform (the "M3" at the end of the designator means this is a third-generation iteration of modernizing this type) with new on-board systems it does have a finite end to its service life looming in the not-too-distant future. There is also nothing in development to replace it inside of Russia's military aircraft sector, which creates a "use it or lose it" mentality about how these aircraft are operated. A contributing factor in the crashes of this aircraft is that Russian air crews have suffered for a long time from not having enough hours in order to be qualified to fly operational missions. When Moscow invaded Georgia in 2008, the Russian General Staff initially wanted to order a Tu-22M3 aircraft to bomb Tbilisi, the Georgian capital. A crew with enough hours to be current enough to fly the mission could not be found, so a crew had to be dragooned from a training base, as only the training crew members had sufficient operational hours. This aircraft was shot down because not even this crew was experienced enough to keep from under-estimating the Georgians' air defense network. Whether its operating in unsafe conditions while training to attack the U.S. Navy, making dangerous intercepts of US aircraft and ships or launching air crews with not enough hours to be current, Russia's military is clearly training for a war and not bothered about maintaining the peace. "The Soviet military and political leadership of the Cold War was terrified of war—they had enough near-term memories of what WWII was like and would go to some lengths to avoid it," said a former Pentagon official who spoke to the Free Beacon. "The people in charge in the Kremlin appear to have very little—if any—of this type of self-restraint."